PATAGONIA’s contribution to the pack-and-bag market for 2010 has more to do with expeditions than solo outings. 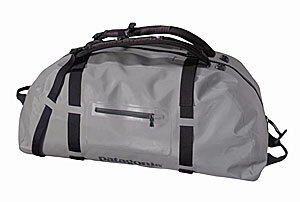 The redesigned Stormfront Duffel ($400) was one of our reviewers’ favorite products. The new bag is made of the same material as Patagonia’s Great Divider series (which have great survivability on airlines). It’s waterproof, gigantic, and it has a very nifty strap-adjustment system that basically welds a backpack cinch to a common button/buttonhole setup. Further, the Guidewater Duffel has also received the Great Divider treatment. Meanwhile, L.L. 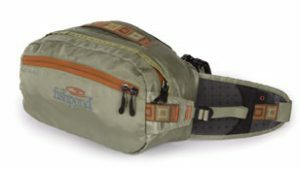 Bean introduced a highly affordable Waterproof Fishing Sling Pack ($99, left) with welded seams designed to withstand pounding rain, powerful surf, and even full-out dunkings. 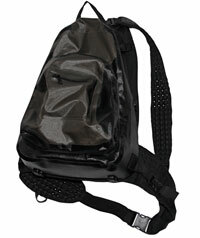 The shoulder and waist straps are also removable, so the Pack could easily double as a boat bag. The next time we fish the blitz from the beach, our camera and spare dry clothes are gonna be stowed in one of these sharp-looking and functional packs. Bean also introduced the Kennebec Lumbar Pack ($59) a large-capacity brown-and-orange pack which looked substantial enough to haul equipment for two. The company tried hard to come up with a “catch-free,” water-resistant design that allows for easy, single-handed access. 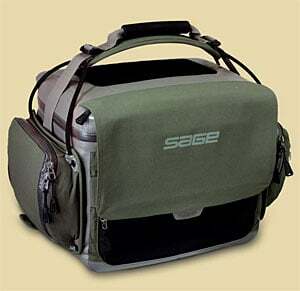 The new Sage Boat Bag ($225) allows you to create whatever sized compartments you want with moveable velcro dividers. The cover flap of the bag has a clear, waterproof compartment on the underside where one could put a fishing or captain’s license, passport, wallet, keys, into a water tight, viewable compartment. Sage also cleverly used a strong magnet on the cover flap so you aren’t forced to rezip things, but the zip closure of the bag lid is strong enough that you can pick the bag up without fear of it flying open. with security straps, and an interior closed cell foam insert with hackle protection wall. A two-way zip down workspace completes the package. Fishpond had several new luggage and personal travel items at the show this year, but our reviewers’ favorite model was the Havana lumbar pack. The Havana is a stripped-down model (especially for Fishpond), in a neutral khaki color scheme. It has fewer pockets and bangles, which should mean a bigger overall carrying capacity for the things you really need, like fly boxes and lunch. With an adjustable lumbar strap system, and an attractive $69 price, this one looks like a winner. Fishpond is also offering their cheapest vest ever, the Flint Hills vest, which manages to be fully-featured and very attractive at only $89.